Laudamotion has announced that it will double its Airbus fleet from 9 to 18 aircraft by next summer following the completion of Ryanair’s purchase of 75% shareholding in the airline from Niki Lauda in August. 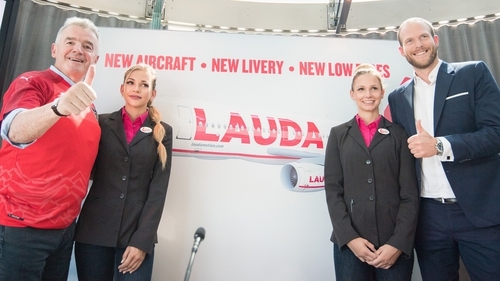 Laudamotion also announced a new aircraft livery which reflects the airline's Austrian heritage. The airline has guaranteed starting salaries for captains of €90,000 per annum, and first officer starting salaries of €46,000 per annum. Laudamotion will roll out a winter roster of 5 days on and 3 days off, and a new personnel director, Christian Euler Rolle, will start on September 1. Speaking in Vienna, Laudamotion’s CEO, Andreas Gruber, said the airline faces the future with great confidence, backed by Ryanair. "Laudamotion has already achieved load factors over 90% in its first summer season, thanks to the efforts of over 500 Laudamotion colleagues. These 9 additional 2019 Airbus deliveries ensure that Laudamotion will grow again by at least 20% in 2019 to 5m guests per annum. We look forward to offering even more low fare choices to Austrian and German customers." Ryanair’s Chief Commercial Officer, David O’Brien, said Ryanair is pleased to complete the purchase of a 75% shareholding in Laudamotion. "We applaud the extraordinary work of Niki Lauda, Andreas Gruber and all the Laudamotion team in the face of very difficult market circumstances and unfair competitor activity to deliver this flying programme this summer, which has provided low fares for the first time ever on over 53 routes. "We look forward to fulfilling Niki Lauda’s vision of Laudamotion as Austria’s No. 1 low fare airline and providing competition and choice to the high fare airlines which have for too long fleeced Austrian and German consumers/visitors," Mr O'Brien said. "We also wish Niki a very speedy recovery and look forward to welcoming him back as soon as possible."